Here's the second of our photographs from the Phillip Shales collection, taken on Chairman's Sunday 1948, as the Middlewich Scouts begin to turn from Leadsmithy Street into Hightown on their way to take their places with the rest of Middlewich in St Michael & All Angels church. When the photographer took this picture he would probably have had no regard at all for its background but to us, in the second decade of the 21st Century, it holds just as much interest as the Scouts in the middle distance. It is of course, as the sign plainly informs us, Challinor's Newsagent's shop situated just at the spot where Leadsmithy Street becomes Lewin Street. As this is a Sunday, and an old-fashioned Sunday at that, the shop is firmly closed, but the signs on the front speak elequently of their time: PLAYERS PLEASE and GOLD FLAKE bear testimony to the then almost universal habit of smoking at every available opportunity. My Mother often used to tell me that in her younger days people used to consider her 'peculiar' because she didn't smoke. Also advertised is PICTURE POST a photo news magazine published from 1938 to 1957, which numbered among its contributors such distinguished writers as J B Priestley, James Cameron and Fyfe Robertson. Next to the Picture Post ad is another ad, or inscription, which is almost impossible to make out in the shadows under the shop's sun blind. It's very indistinct, but looks something like E HADER. Has anyone any ideas? The scouts themselves are very much of their time with, as Geraldine Williams points out, the original, classic, scout hats on their heads. Their leader, who is supervising them as they make the turn into Hightown, is everyone's idea of what a Scout Leader ought to look like. But it's the shop itself which is a revelation. Who knew that there was a cottage tacked onto the end of it at one time? In actual fact, there does seem to be a difference in the brickwork between the cottage and the shop. Could it have been that the cottage was built on the end of the shop, and then taken down again? 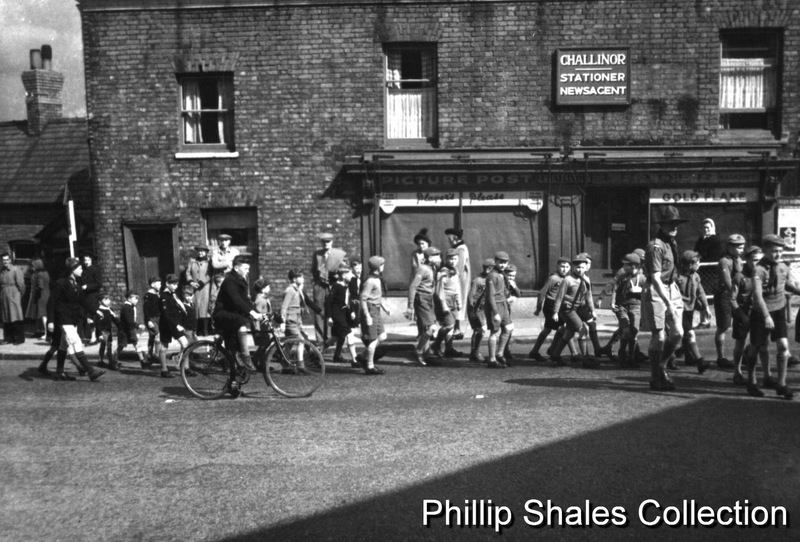 This photo, which shows the 2nd Middlewich Guides about to pass the shop (which by that time belonged to Les Gibbins) in the 1970s, shows the different brickwork at the end of the shop after the cottage had been demolished. That shop, against all odds, is still with us today, but has been empty for many years. UPDATE: I've been doing some twiddling with the relevant section of the photograph to see if I could tease out what that other advert (or inscription) might be. The second word is definitely 'Magazine'. Would it be TRADER Magazine?